Louisiana Grills has the solution to all your grilling needs. This Country Smoker pellet grill not only grills, but also slow roasts, smokes and bakes. It features 14 gauge powder coated steel construction and an arched flavor guard to reduce flare-ups and allow more juices to evaporate back into the meat as flavor. The reinforced lid with the chimney-less design means more smoke comes in contact with your food, providing a better flavor. The 497 square inches of porcelain coated grilling surface provide enough room to cook for a family of four. The large, stainless steel burn grate along with the flame broiler in the open position allows you to reach temperatures up to 1000 degrees for grilling. The airflow created within the Country Smoker line of grills allows for convection cooking, meaning the temperature at the top of the grill is close to the same temperature as the grilling surface. The auto-start electric igniter and feed system lets you set your temperature, push start, sit back and relax. The natural wood pellets feed into the burn pot where they are automatically ignited and the fan-cooled hopper and feed system keeps your grill at the temperature of your choosing. The Digital Control Center lets you set your desired temperature and automatically maintains it during the grilling process. With the included food probe, you can set you desired food temperature and the grill will automatically go into smoke mode when that temperature is reached, preventing over cooking. The lid thermometer enables you to monitor the temperature inside the grill and the grease bucket catches run off grease from the flavor guard. The 12 pound capacity hopper holds enough pellets for up to 8 hours of cooking. The auger and burn pot system on this grill uses 1 1/2 pounds of pellets per hour on low (180 degrees) and up to 7 pounds per hour on the highest setting (600 degrees). The CS-450 cart has a solid bottom shelf for storage and also features two leveling legs for stability and two wheels for easy movement. 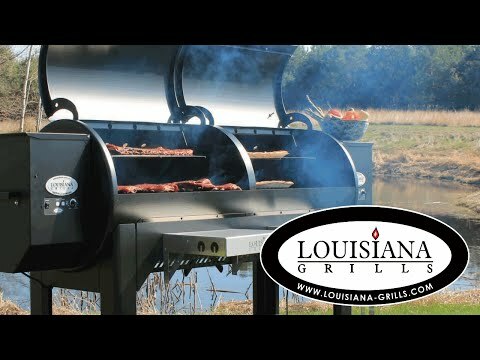 All Louisiana Grills Country Smoker models are manufactured in North America. Cooking Grid Dimensions 25 1/2 X 19 1/2"
Louisiana Grills offers a five (5) year limited warranty from the date of purchase against defects and workmanship on all steel parts (excluding the burn grate), and a three (3) year limited warranty on all electrical components. Louisiana Country Smokers offers a classic barrel smoker design with valuable cooking space that offers more grilling area than many other grills its size. Louisiana Country Smokers hold up to 12 pounds of pellets and produce a wide temperature range of 170 degrees to over 600 degrees. The grill features stainless steel burn grates that cover the direct heat, for low and slow cooking. However, one of the plates feature an adjustable broiler grid, allowing the fire to rise to the grilling surface for flame kissed broiling. The heavy gauge steel exterior, reinforced curved lid and chimney-less design allow this grill to hold temperatures better than other pellet grills in this price range, and help in providing an even cooking surface through convection heat. The auto-start Digi-Que controller allows you to simply set your temperature to start. The included programmable food probe monitors your foods internal temperature. The grill automatically goes into smoking mode once the set temperature is reached. This prevents your food from over cooking if left on the grill. Louisiana Country Smokers have a higher pellet consumption than similar grills, only burning up to 8 hours with 12 pounds of pellets. This means you will have to refill the hopper for longer smokes, like brisket. You prefer North American made products and intend to take advantage of this country smoker's ability to reach lower temperatures than any other grill we carry. 25 1/2 X 19 1/2" 22 X 19" 22 X 19" 22 X 19"